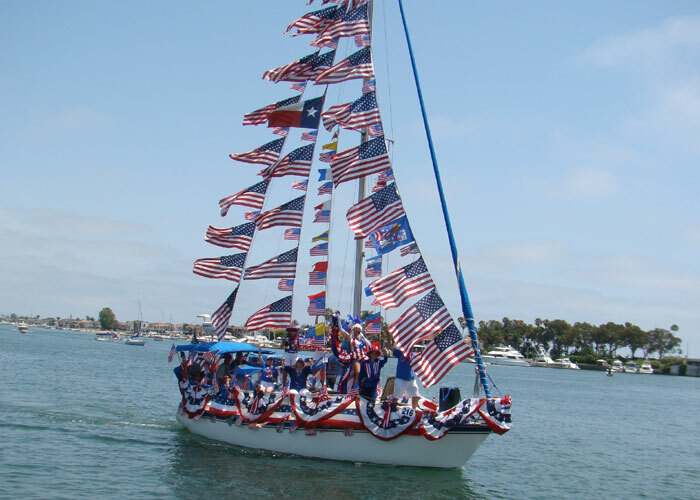 NEWPORT BEACH — American Legion Yacht Club Post 291 members showed their love for the red, white and blue once again during the group’s annual Old Glory Boat Parade on Independence Day. This year, 35 boat owners decorated their vessels to the theme of “Stars and Stripes Forever Is the Color of our Freedom” and paraded through Newport Harbor. Parade winners were announced at a special awards dinner July 28, and a slide show of parade highlights was presented. Also noteworthy was the amount of “show” put on by the boats. One example: The crew on the Hayden Marine Insurance vessel, Hayden’s Havoc, did handstands for the crowd of parade spectators. Sweepstakes Award: Champagne Lady; Peggy Jo Sherrow. Commodore Award: Cartnan; W. Carlton Spencer. Costumes: Kani Nalu; Todd Terrau. Decoration: Spending It; Lou Nese. Animation: No Corkage; Karl Kreutziger. Sound: Lucky Star; Mark Wyland. Power: Manalea; Mike and Janelle Starkweather. Electric: Riding the Current; Vanessa Butler. Wood Classic: Colnett; Steven Farwell. Tugboat: Tug O’ My Heart; Jeanie Lowry. Dinghy: 10-foot Achilles; Tom Mallard. Judges’ Discretion: Nauti-Gal; Bill Bennett.